Eryngion Campestre. 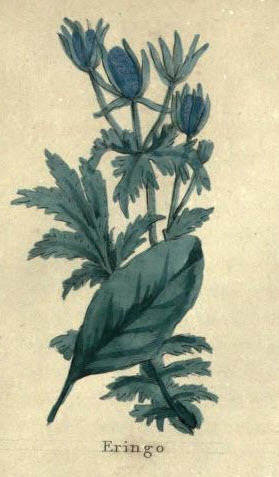 A wild plant, growing by the sea-side, and in gardens, for its medicinal uses. It is prickly, like a thistle, and the plant is whitish. The stalk is firm, woody, round, striated and thick, branched and spread irregularly about. The leaves are small, of a pale, bluish green; broad, oblong, jagged and prickly. The flowers grow in little heads at the tops of the stalks, with a circle of small leaves under them. They arc of a pale greenish white. The root is long and slender, sometimes from five feet long; its taste is pleasant. The plant is venereal, and breeds seed exceedingly, and strengthens the spirit procreative. Thedecoction of the root in wine, opens obstructions of the spleen and liver, and is good for yellow jaundice, dropsy, pains of the loins, and for colic. The candied roots are most excellent for coughs, and general debility. They possess rare virtues as a diuretic, and are a good remedy for jaundice. They are balsamic as well as diuretic. The roots bruised and applied outwardly, are good for King's evil. The roots bruised and boiled in hog's lard, and applied to broken bones, thorns, etcetera. remaining in the flesh, they do not only draw them forth, but heal up the place again, gathering new flesh where it was consumed.